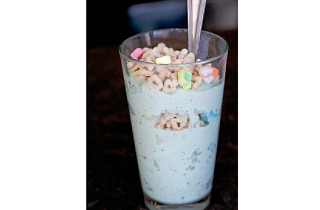 This mint shake has Lucky Charms. And it's incredible. 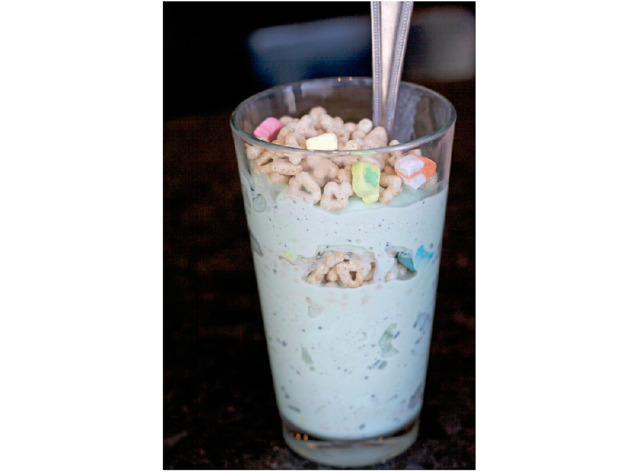 ​Two of my favorite things growing up were mint chocolate chip ice cream and Lucky Charms. I suppose that means I haven't grown up a bit, as I will shovel these two sugar rushes in my face whenever my health consciousness wanes. Now the folks at DMK Burger Bar and Evanston's new DMK Burger & Fish are taking the whole March-mint-milkshakes game to new level with their Shamrock Shake ($5). It's more of a parfait, frankly, with a core layer of the General Mills marshmallow cereal and a scoop on top (along with a candied mint leaf). The blended chocolate chips from the ice cream (it's from Oak Park's Peterson's Ice Cream) give this thing a little more bite than your average Green No. 3 tinted drink. You're going to need a spoon.